With the new college football season finally upon us, it’s time to go on record for how the 2015 season will unfold. The arrival of new head coach Mike Riley, and the installation of an entirely new offensive and defensive structure, this year becomes even more challenging than most to call. But we know, pretty much, as much as we’re going to know before the ball is teed up for real. So it’s time to make a call, and have something to look back on in January –either with pride or dread. Even coming off a bowl appearance, the Jaguars should be outmatched when they arrive in Lincoln. Assuming Nebraska is at some level ready to play, talent should prevail. If Riley’s first test was a big ask, his first game on the road is even bigger. Even with injury problems, a head coach in Al Golden who has yet to impress, and a less-than-intimidating home field, asking Nebraska for a win here in year one seems too much of a stretch. The Golden Eagles may be on the road back to respectability, but there’s still a long way between that and being competitive with Nebraska in Lincoln. Any fears of a repeat performance from Southern Miss like in Bill Callahan’s first year should be unfounded. Firing head coach Tim Beckman less than two weeks before the season starts can’t be helpful for Illinois’ preparation. While it does remove the “dead man walking” element from the season, having an interim coach should make this season feel a bit lost for the Illini. Time to get bold. Yeah, the Badgers have humiliated Nebraska in their last two meetings. But Melvin Gordon is now in the NFL. Joel Stave is still quarterback for Wisconsin. The Badgers are going through a coaching change, although nowhere near the kind of culture change as at Nebraska. And, perhaps most importantly, Nebraska’s new defensive scheme should be far better suited to stop Wisconsin’s rushing attack (as pointed out by a smart and particularly handsome analyst). Add to that mix the fact that the game is in Lincoln, where Nebraska is 1-0 against Wisconsin (take that, Bucky! ), and it’s time to risk being called a homer. Yes, Goldie has a two-game winning streak over Nebraska. Yes, Minnesota’s program is flourishing under head coach Jerry Kill. But I still can’t buy the Gophers as a contender to make it three over Nebraska, even in Minneapolis. As with Wisconsin, Nebraska’s struggles with the Gophers over the last couple of years have come in large part because of a self-imposed mismatch due to former head coach Bo Pelini’s defensive structure. Add to that Minnesota losing three top-flight players to the NFL in the last two years (defensive lineman Ra’Shede Hageman, running back David Cobb, and tight end Maxx Williams), and the Gopher run of good fortune should end in 2015. It really is amazing how the 2013 game against Ohio State in Evanston seems to be a high-water mark for Northwestern. Going into that game, the Purples were nationally ranked and had ESPN’s Gameday on campus. But after Ohio State did the business against them, the program has been on a downward trajectory. Northwestern’s trajectory against Nebraska is on a similar arc. After winning in Lincoln in 2011, the Purples lost two straight heartbreakers. But last year, Nebraska was able to pull away and win convincingly, in Evanston. There’s little reason to think that trend line should change this season. Illinois’ dismissal of Tim Beckman probably helps to ensure that Purdue won’t finish in last place this season in the B1G West. But even with a road trip, the talent disparity should help Nebraska to a comfortable win on Halloween. Having Nebraska at 8-1 at this stage of the season may seem like irrational exuberance about NU’s 2015 season. But any such exuberance would end with the Spartans roll into town. With a veteran returning quarterback in Connor Cook, a talent level equal to if not surpassing Nebraska, and a stingy defense, NU’s fairy-tale start to the season looks to end. It’s tempting to see this game as a trap game, particularly coming off of what is likely to be a physical and emotional beat-down for Nebraska the week before. A long trip against an improving Rutgers team in that scenario is a recipe for disaster. But given how late in the season this game is and the kind of experience Riley and his staff have, Nebraska should be prepared enough to survive a closer-than-expected contest. The Heroes Game hasn’t quite grown into the rivalry that the B1G hoped it would when Nebraska joined the league. But the games have been competitive (if not necessarily watchable, other than last year’s overtime contest in Lincoln). Iowa looks on track to another middle-of-the-pack conference season under head coach Kirk Ferentz. If that’s the case, and Nebraska has a chance to clinch the division in Lincoln, the game could have an energy it has been hoping for. Look for Nebraska to shade a close one. So, Riley gets a trip to Indianapolis in his first year. Safe money has Nebraska facing off against Ohio State, the first ever unanimous pre-season no. 1 in the Associated Press. But don’t be surprised if it’s Michigan State, not Ohio State, that represents the B1G East in Indianapolis. Yes, the Buckeyes were dominant in the postseason last year. But don’t forget, that same Buckeye squad lost to Virginia Tech and were outplayed for large swaths of the game against Minnesota. Regardless of whether it’s Ohio State or Michigan State, though, neither team is a good matchup for Nebraska. 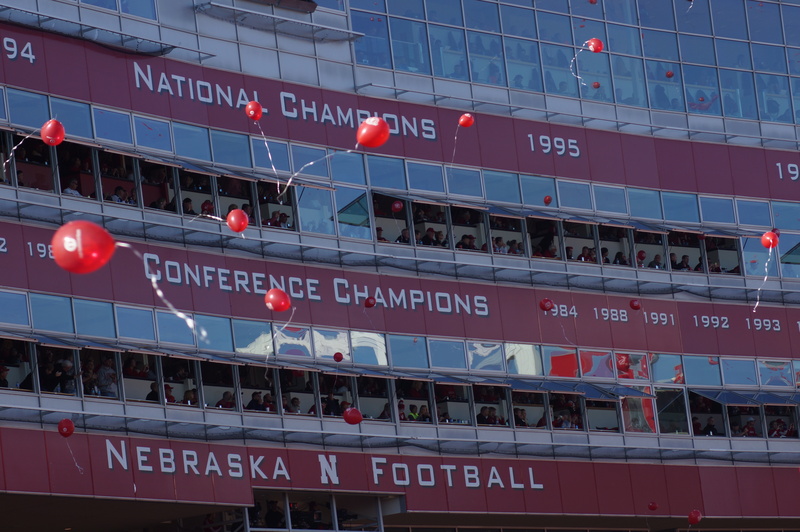 Making it to Indianapolis will be a great accomplishment for Riley in Year One, but asking for a number to be added next to the lonely “1999” on the East Stadium façade for conference championships is a step too far.